Lyman Frank Baum (May 15, 1856 – May 6, 1919) was an American author, actor, and independent filmmaker best known as the creator, along with illustrator W.W. Denslow, of one of the most popular books in American children's literature, The Wonderful Wizard of Oz, better known today as simply The Wizard of Oz. The Wonderful Wizard of Oz, written in 1900, and produced for stage in 1902, was immortalized through the 1939 movie starring Judy Garland, and soon become an iconic part of American culture. Part fairy tale, part fable, it featured Dorothy, as the girl who leaves Kansas in a tornado, her beloved dog, Toto, the Tin Man, the Cowardly Lion, and the Scarecrow, and a story line uniquely American in its background and setting. The moral of the story—"that with the help of a few good friends, you can find all that you need within yourself"—resonated with American audiences for many years; from 1956 onwards the televised movie held American children—pre-video age—rapt with attention. Baum was a prolific writer, who in addition to children's books, wrote plays, short stories, and fantasy under various pseudonyms, was coaxed into writing sequel after sequel to his Wonderful Wizard of Oz book by the incessant pleas of his youthful fans. Although his other children's books and theatrical productions did not receive nearly the critical acclaim of Oz, he was made wealthy through its unprecedented popularity and adaptations. Baum was born in Chittenango, New York, in 1856, into a devout Methodist family of German (father's side) and Scots-Irish (mother's side) origin, the fifth of six children born to Cynthia Stanton and Benjamin Ward Baum, only three of whom survived into adulthood. He was named "Lyman" after his father's brother, but always disliked this name, and preferred to go by his middle name, "Frank." His mother, Cynthia Stanton, was a direct descendant of Thomas Stanton, one of the four Founders of what is now Stonington, Connecticut. Benjamin Baum was a wealthy businessman, who had made his fortune in the oil fields of Pennsylvania. Baum grew up on his parents' expansive estate, Rose Lawn, which he would fondly remember in later years, as paradise. As a young child, he was tutored at home with his siblings, but at the age of 12 he was sent to study at Peekskill Military Academy. He was a sickly child given to daydreaming and after two years, returned home. Baum started writing at an early age, and when his father bought him a printing press, he used it to produce The Rose Lawn Home Journal with the help of his younger brother, Henry (Harry) Clay Baum. By the time he was 17, Baum had established a second amateur journal, The Stamp Collector, and had printed an 11-page pamphlet called Baum's Complete Stamp Dealers' Directory. As a young man, Baum embarked upon his lifetime infatuation with the theater, a devotion which would repeatedly lead him to failure and near-bankruptcy. His first such failure occurred when a local theatrical company duped him into replenishing their stock of costumes, with the promise of leading roles that never came his way. Disillusioned, Baum left the theater and went to work as a clerk in his brother-in-law's dry goods company in Syracuse. At one point, he found another clerk locked in a store room dead, an apparent suicide. This incident appears to have inspired his locked room story, "The Suicide of Kiaros," first published in the literary journal, The White Elephant. Baum never stayed away from the stage for long. He continued to take roles in plays, performing under the stage names of Louis F. Baum and George Brooks. In 1880, his father built him a theater in Richburg, New York, and Baum set about writing plays and gathering a company to act in them. The Maid of Arran, a melodrama with songs based on William Black's novel A Princess of Thule, proved a modest success. Baum not only wrote the play but composed songs for it and acted in the leading role. His aunt, Katharine Gray, founder of the Syracuse Oratory School, played his character's aunt. On November 9, 1882, Baum married Maud Gage, a daughter of Matilda Joslyn Gage, a famous women's suffrage activist. While Baum was touring with The Maid of Arran, the theater in Richburg caught fire during a production of Baum's ironically-titled parlor drama, Matches, and destroyed not only the theater, but the only known copies of many of Baum's scripts, including Matches, as well as costumes and props. In July 1888, Baum and his wife moved to Aberdeen, Dakota Territory, where he opened a store, "Baum's Bazaar." Local children loved to buy penny candy there and hear stories from Baum of faraway places. His habit of selling goods on credit led to the eventual bankrupting of the store, so Baum turned to editing a local newspaper, The Aberdeen Saturday Pioneer. This enterprise also, however, ended in bankruptcy with Baum sardonically commenting, "I decided the sheriff wanted the paper more than I." Baum's description of Kansas in The Wonderful Wizard of Oz seems to be based on his experiences in drought-ridden South Dakota. 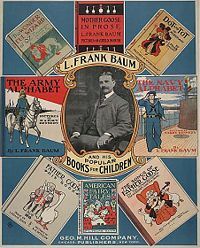 Promotional Poster for Baum's "Popular Books For Children," 1901. After Baum's newspaper failed in 1891, he, Maud, and their four sons moved to Chicago, where Baum took a job reporting for the Evening Post. For several years, he edited a magazine for advertising agencies focused on window displays in stores. At that time, the major department stores created elaborate Christmas time fantasies, using clockwork mechanisms that made people and animals appear to move. 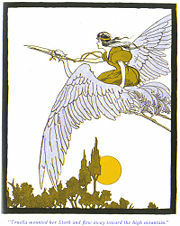 In 1897, he wrote and published, Mother Goose in Prose, a collection of Mother Goose rhymes written as prose stories, and illustrated by Maxfield Parrish. Mother Goose was a moderate success. In 1899, Baum partnered with illustrator W.W. Denslow, to publish Father Goose, His Book, a collection of nonsense poetry. The book was a success, becoming the best-selling children's book of the year. Baum was now free to devote himself full time to writing. In 1900, Baum and Denslow (with whom he shared the copyright) published The Wonderful Wizard of Oz, to much critical acclaim. The book was the best-selling children's book for two years after its initial publication. Baum went on to write thirteen more novels based on the places and people of the Land of Oz. Two years after Wizard's publication, Baum and Denslow teamed up with composer Paul Tietjens and director Julian Mitchell to produce a musical stage version of the book under Fred R. Hamlin. This stage version, the first to use the shortened title, The Wizard of Oz, opened in Chicago in 1902, then ran on Broadway from January to October 1903. Subsequently, the play successfully toured the United States with much of the same cast until 1911. The stage version starred David C. Montgomery and Fred Stone as the Tin Woodman and Scarecrow, respectively, which brought them instantaneous fame. The stage version differed from the book, and was aimed primarily at adults. Beginning with the success of the stage version, most subsequent versions of the story, including newer editions of the novel, have been titled The Wizard of Oz, rather than using the full, original title. In more recent years, restoring the full title has become increasingly common, particularly to distinguish the novel from the Hollywood film. Following early film treatments in 1910 and 1925, Metro Goldwyn Mayer made the story into the now classic movie The Wizard of Oz (1939) starring Judy Garland as Dorothy. Among other minor changes, the film was given an "it was all-just a dream ending." A completely new Tony Award-winning Broadway musical based on African-American musical styles, The Wiz, was staged in 1975, with Stephanie Mills as Dorothy. It was the basis for a 1978 film by the same title starring Diana Ross as an adult Dorothy. In 1901, Baum and Denslow published Dot and Tot of Merryland. The book was one of Baum's weakest, and its failure strained his faltering relationship with Denslow. It would be their last collaboration. Several times during the development of the Oz series, Baum declared that he had written his last Oz book and devoted himself to other works of fantasy fiction based in other magical lands, including The Life and Adventures of Santa Claus and Queen Zixi of Ix. However, persuaded by popular demand, letters from children, and the failure of his new books, he returned to the series each time. Even so, his other works remained very popular after his death, with The Master Key appearing on St. Nicholas Magazine's survey of readers' favorite books well into the 1920s. His final Oz book, Glinda of Oz was published a year after his death, in 1920, but the Oz series was continued long after his death by other authors, notably Ruth Plumly Thompson, who wrote an additional nineteen Oz books. Baum continued theatrical work with Harry Marston Haldeman's men's social group, The Uplifters, for which he wrote several plays. The group, which also included Will Rogers, was proud to have had Baum as a member and posthumously revived many of his works. 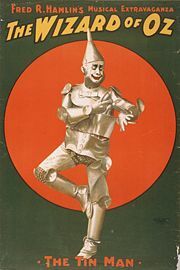 Prior to that, his last produced play was The Tik-Tok Man of Oz (based on Ozma of Oz and the basis for Tik-Tok of Oz), a modest success in Hollywood that producer Oliver Morosc decided did not do well enough to take to Broadway. In 1914, having moved to Hollywood years earlier, Baum started his own film production company, the Oz Film Manufacturing Company. He served as its president, and principal producer and screenwriter. The rest of the board consisted of Louis F. Gottschalk, Harry Marston Haldeman, and Clarence R. Rundel. The films were directed by J. Farrell MacDonald, with casts that included Violet Macmillan, Vivian Reed, Mildred Harris, Juanita Hansen, Pierre Couderc, Mai Welles, Louise Emmons, J. Charles Haydon, and early appearances by Harold Lloyd and Hal Roach. These later ventures into bringing children's literature to film did not meet with much success. Baum, plagued by a weak heart since childhood, died of a stroke on May 6, 1919, aged 62, and was buried in the Forest Lawn Memorial Park Cemetery, in Glendale, California. Kansas is mentioned 23 times in the movie and the whole plot centers on Dorothy trying to get back home. But some Kansas residents, perhaps slightly tongue-in-cheek, complain that the state has been cursed with an image of a bleak and tornado-ridden wasteland that Dorothy dreams of escaping. They point out that only the Kansas scenes are not in Technicolor. Those critics are heartened by speculation that Baum was not describing Kansas at all in his books, but chose Kansas to avoid embarrassing relatives still living in South Dakota. In 2000, when plans were announced for an $861 million theme park called the Wonderful World of Oz to be built near De Soto, Kansas, the front pages of area newspapers revealed that Baum, while publisher of the weekly newspaper, The Saturday Pioneer, in Aberdeen, South Dakota, published editorials in 1890 and 1891 that called for the annihilation of Native-Americans. The plans for the park in Kansas were halted but there is still an effort by Oz Central, who own the rights to the family trust of L. Frank Baum, to locate it in other states. The Indiana Wizard of OZ Festival celebrated its 27th Anniversary in 2008, and claims to be the largest Oz festival in the world. Baums' hometown Chittenango, New York, has the L. Frank Baum Oz Museum and hosts an annual Oz Fest, a three day event held in late May or early June. The Land of Oz was a theme park built on Beech Mountain in Watauga County, North Carolina. It was called "exquisite" and an "adventure, imaginative and unspoiled" by the Washington, D.C. Daily News, which gave the park its annual award in 1970, as the best new tourist attraction in America. It closed in 1980, the victim of the changed resort economy. The Wizard of Oz continues to inspire new versions such as Disney's 1985 Return to Oz, The Muppets' Wizard of Oz, Tin Man (a re-imagining of the story televised in late 2007 on the Sci Fi Channel), and a variety of animated productions. Today's most successful Broadway show, Wicked provides a backstory to the two Oz witches used in the classic MGM film. Wicked author Gregory Maguire chose to honor L. Frank Baum by naming his main character Elphaba—a phonetic take on Baum's initials. In addition to the classic The Wonderful World of Oz, Frank L. Baum wrote 55 novels in total, 82 short stories, over 200 poems, an unknown number of scripts, and many miscellaneous writings. The Wonderful Wizard of Oz (1900) ISBN 0199540640. The Marvelous Land of Oz (1904) ISBN 0590085654. Ozma of Oz (1907) ISBN 978-0548814826. Dorothy and the Wizard in Oz (1908) ISBN 9780688098261. Sam Steele's Adventures—The Scream of the Sacred Ape (novel, 2006) First publication under Baum's name of The Boy Fortune Hunters in China (1909). Sam Steele's Adventures—The Amazing Bubble Car (novel, 2008) First publication under Baum's name of Sam Steele's Adventures in Panama (1907). Wagner, Sally Roesch. 2003. The Wonderful Mother of Oz. Fayetteville, NY: The Matilda Joslyn Gage Foundation. ↑ Literary Traveler, The Man Behind the Curtain: L. Frank Baum and the Wizard of Oz. Retrieved July 19, 2008. ↑ "L. Frank Baum," St. James Encyclopedia of Popular Culture (St. James Press, 2000). ↑ Isabel Wilkerson, Kansas Journal; The Land Wherein 'Wizard' Is A Humbug. Retrieved July 19, 2008. ↑ Mary Pierpoint, Was Frank Baum a racist or just the creator of Oz? Indiancountry.com. Retrieved July 19, 2008. ↑ .Jill Terreri, Oz Leader Outlines Plan For New Theme Park, Oz-central.com. Retrieved July 19, 2008. ↑ www.museum.appstate.edu, Land of Oz Theme Park. Retrieved July 19, 2008. "L. Frank Baum." St. James Encyclopedia of Popular Culture. St. James Press, 2000. "L(yman) Frank Baum." St. James Guide to Children's Writers. St. James Press. 1999. 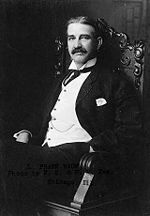 "Lyman Frank Baum." Dictionary of American Biography. American Council of Learned Societies, 1928-1936. Gjovaag, Eric. The Wonderful Wizard of Oz Website. Wizardofoz.info. The Wonderful Website of Oz! Put.com. Terreri, Jill. 2003. Oz Leader Outlines Plan For New Theme Park Oz-central.com. History of "L. Frank Baum"
This page was last modified on 17 June 2018, at 21:20.